My daughters iPhone 4s home button stopped working. No problem I thought, replacements are only a few quid from your favourite auction site, so I ordered one. Went through the iFixit.com guide, which is quite some going, the screws are tiny, and you virtually have to dismantle the entire phone to get to the button. Anyway, got it all back together, powered up the phone, button still didn’t work! Now it could have been a duff button, or I could have knackered it during the replacement. Got another button, tried the same, still no joy! With my multi-meter I did some buzzing out of the tiny home button and ribbon cable, and the dock connector ribbon cable, all seemed reasonable. I even got a new dock connector ribbon cable just in case, still the home button refused to work. So I reckoned I was now out of my depth, a motherboard problem, or some weird software issue (we had factory reset it in case that was the issue, it wasn’t). Finally when reassembling the dock ribbon cable for the last time, I noticed the motherboard around the connector looked a bit of a mess. This was a second-hand iPhone, and its obvious that someone else has been inside it before me. 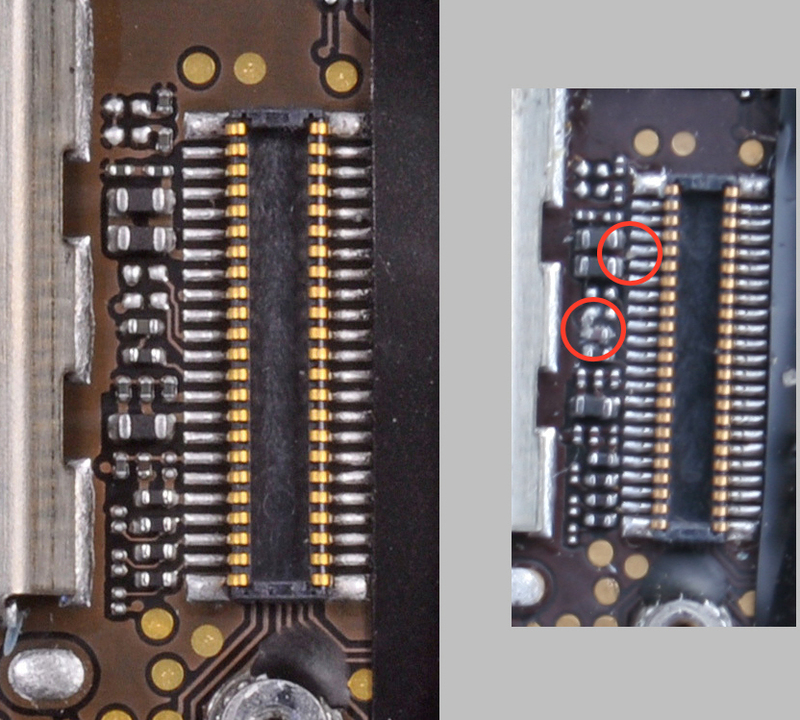 It looked like there was some corrosion on some of the components just below the connector. I went searching the interweb for a close up of what the connector should look like, and found one on anandtech.com. Comparing that to mine, it did look like two possible bits of something shorting pins/components. So I very carefully picked those away with a sliver of paper edge on. Reassembled it. Et voila! The home button works again. 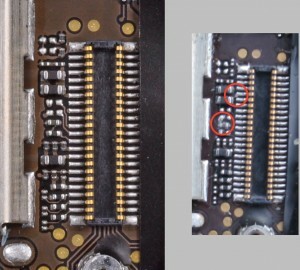 Below is a close up of the connector from an image on anandtech.com, and the best I could get of our connector. The two lumps of stuff that I dislodged are circled. Fingers crossed that’s all it was. This entry was posted on Sunday, April 5th, 2015 at 6:59 pm BST and is filed under repair. You can follow any responses to this entry through the RSS 2.0 feed. You can skip to the end and leave a response. Pinging is currently not allowed.